Every Monday at 6 pm throughout the year, no matter the weather, you can find a group of people to run with at Big River Running. Runners and walkers of all ages, paces and fitness levels are welcome. Bring your dog, push a stroller, the more the merrier! New for 2019 we are offering the option to bundle a Silver Plan and Yasso Workout package for only $80! While many people training for a half or full marathon focus on long runs and the endurance aspect of training, speed and pace work play a very important role and should not be overlooked! This Training Team season we are offering the option to participate in a structured weekly speed workout with the guidance of a coach. Last season we introduced Yassos to Training Team and it was so well received (we’re talking PRs, baby! ), that we wanted to make sure our Spring participants got a chance to experience them. Let’s have “yeah so much fun” with Yasso 800s each week this spring! Yasso 800s were created by the famous Bart Yasso – the “mayor of running” and Runner’s World’s Chief Running Officer. The workout system is simple and has proven to be a successful for thousands of runners every year. The workout consists of running 800m intervals each week. The eventual goal is to complete 10 x 800m (with a 400m rest) at the same pace as your goal marathon time. 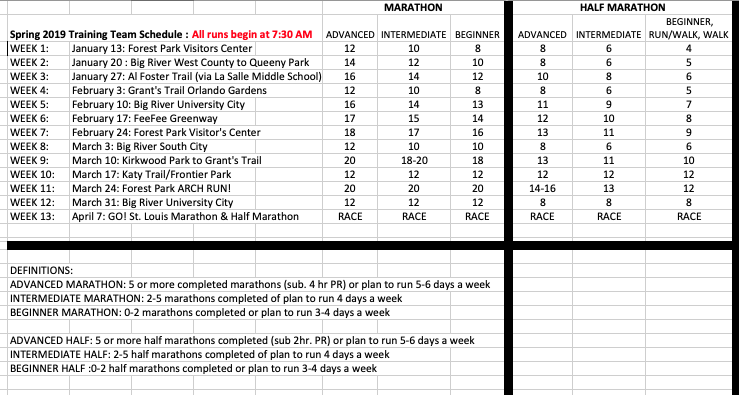 In other words, if your goal is to run a marathon in 4 hours (4:00), your goal pace for the 800s would be 4:00. We will start with 4 or 5 intervals and progress toward 10 by the end of season. For those racing a half marathon, don’t worry, there is a simple conversion we can apply to make these work for the half marathon as well. This will surely be a new and exciting approach to our half and full marathon speedwork sessions. We hope you will join us! Yasso Much Fun Wednesdays will go from January 30 – March 27. We will meet at Meramec Community College. All workouts start at 6:30 p.m. The workout package is included at the Gold Level and Silver Plus Level but can also be purchased separately if you choose to participate at the Free Level. One-on-one sessions could include learning to improve your running mechanics, learning appropriate workouts such as speed work, tempo running, hill workouts, etc., discussing race strategy and race day preparation, instruction on strength training and flexibility exercises or simply having a support system present with you with a stop watch as you complete a hard workout! “Pay as you go” Coaching Sessions – $50 – two 30 minute sessions or 1 hour-long session. Offered only for BRPC clients who have purchased a training plan and want ad hoc support during the training cycle or for one-on-one clients who want support but are in between phases. Initial goal setting meeting with your coach. Personalized plan written for YOU based on your running goals/fitness level. Unlimited communication with your coach. *NOTE: If your running plans don’t fit into a 6 or 12 week time frame, we offer training plans of any length at a prorated/adjusted cost (max of 16 weeks). 1993 – The year I found my passion for running. During my freshman year of high school, I decided to join the De Smet Jesuit High School track and field team. I initially intended to only run one high school season in preparation for wrestling, but quickly found myself enjoying the challenge of running. What started out as a 12 week commitment to the track and field team ended up as a 4 year high school career. I steadily improved over the course of 4 years of high school and ended up being a varsity runner during my last two seasons. While I was never the fastest runner on the team, it quickly became an important part of my life. I enjoyed the challenge and the constant pursuit of a new personal best. I ran occasionally while attending Truman State University but I took a break from serious training. I returned to the world of distance running in 2001 when I was hired as a teacher and coach at my alma mater, De Smet Jesuit High School. For the last 16+ years, I have had the honor to coach Cross Country and Track & Field. The relationships I build with the athletes year after year drive my passion for running. Over the last several years, I have had the privilege to work with the Big River Training Team and thoroughly enjoyed coaching dozens of Training Team members. My experience as a runner, both in high school and over the last 15 years of road racing, enable me to help Big River’s Training Team excel. Throughout my running career, I have completed numerous 5ks, 10ks, and half marathons and eight marathons with my time ranging from 4:25 in my first ever marathon to my current PR, 3:11. I plan to apply the extensive knowledge and experience I have learned from my own racing to my work as a coach. I am thoroughly committed to helping my clients meet their running goals. Bryan can provide training plans and on a case by case basis, one-on-one coaching. Jim has been a runner for 45 years, starting on a 440 yard cinder track back in the day, running countless 5k,10k and half marathons, and earning a Boston Qualifying 3:22 marathon at age 50. Jim came to Big River upon retiring from a career in education. He spent 17 years in northern Illinois teaching/coaching Track and Cross Country, where teams produced numerous “personal bests,” state championships and all-state runners. After moving to southern Illinois, he finished up his career in education as a principal for eight years and then as a district superintendent for nine years. A family man, Jim has been married for 38 years and has three “running” children and two grandchildren (who run for play!). He currently calls Edwardsville, Illinois home and has had the opportunity to attend every Track and Field Olympic Trials since 1988, a tradition shared with his children. Jim is excited about working with clients of all fitness levels achieve their goals through Big River Personal Coaching. Jim earned USATF Level1 and Level 2/Endurance coaching certifications and can provide training plans and one on one personal coaching sessions. Hear the news first! Want to keep up on all high school related news from Big River Running? Sign up to receive emails (about 4 per year) with news about our discount dates, special sales/deals, camps and more! One way we service our customers is through our robust Community programs. 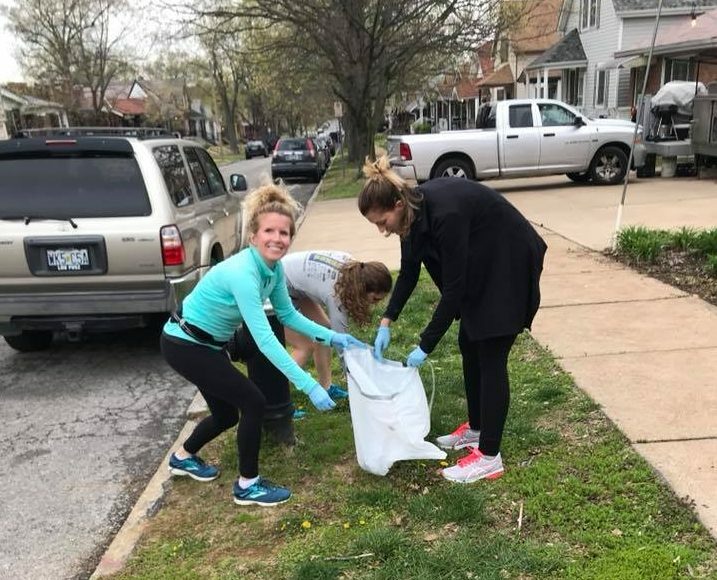 We connect our knowledge and passion for living a healthy, active lifestyle with St. Louis community members and the response is truly amazing! We’ve hosted more than 1,500 runs with more than 20,000 program participants since we opened our doors. Big River has always been more than a place to shop. It’s a place to gather, learn, run, train, socialize and become part of a something bigger than yourself. That’s Big River Nation. We want you to join us. Big River Running Company is one of the first retailers in the country to use a state-of-the-art digital foot scanner developed in Germany. Our staff uses this best-in-class technology to further assess pressure points, degree of pronation and potential support needs that can differ for each customer. Our multi-faceted fitting approach supported by technology helps us find a shoe solution perfect for you! In addition, Big River carries brands who are leaders in incorporating the latest technology into their footwear and apparel. The products we carry are meant to help optimize your performance and comfort. You’ll Love Our Fit Center – Learn all about your foundation in our in-depth fit process. Your dedicated Fit Specialist will answer your questions and meet your needs by measuring the foot length, width and arch, conducting a treadmill analysis of alignment and gait, use of state-of-the art technology to generate a digital foot scan uncovering pressure points and pronation, and provide the proper selection on multiple styles and brands of shoes to find the perfect fit for you. Our Fit Center also provides medical fitting for customers experiencing common foot conditions, health problems, or injuries. Whether it’s your 1st or 100th visit, you’ll discover, learn, or enjoy something new every time. We Care About You (No, Really) – Your health and wellness is at the core of everything we do. For more than 10 years, it is our greatest pleasure to serve the St. Louis community one fit at a time. Our team of knowledgeable Fit Specialists provide efficient, friendly service at a high standard that is unparallel to other retail experiences. The benefits of going to Big River are that you’ll be cared for by our team and become a part of a greater community that supports and encourages you, always. Nothing But the Best – When your health is on the line, we don’t mess around. We’ve curated a broad selection of shoe styles from the highest quality brands known for performance, comfort, and style. Our apparel, gear, and accessories are equally top-notch and we continue to search and share new rave-worthy products to meet our customers needs. We meet for group runs/walks every Sunday at 7:00 am beginning July 9 and going into the end of September to help you prepare for the your fall full or half marathon. Our goal race is The Great GO! Halloween Half. You can still train with the team even if this is not your goal race. *If you are a first-time/beginner marathoner and would like advice on how to properly build up to 6-8 miles so you can begin running with Training Team, email info@bigriverrunning.com. We’re here to help! Keep cool in style with these custom designed technical, moisture wicking running hats (BOCO brand)! Hats will be able to be purchased through Training Team registration only. We have limited quantities available and they’ll be available for pick up July 30. We have a pace for everyone, including walkers and walk/run! On Sunday mornings, we run in groups based on pace, not distance. Pace should be training pace (long run pace), not race pace. Although everyone in your group will run a similar pace, people will be running different distances. We offer paces from 7:30 and faster all the way to a walk group. Note: R/W means run/walk. 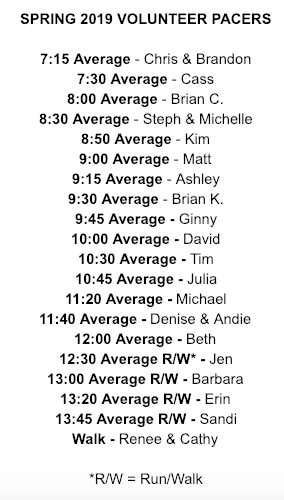 Each run/walk group varies their intervals but averages the listed pace. Big River Personal Coaching supports Big River’s Training Team, lead by head coach Bryan Traughber. Their support, guidance and motivation can help you achieve your goals!